Are you in the market for new pots and pans? If so, I've got a recommendation for you. We were in WalMart the other night when I saw these beauties. They are Paula Deen Nonstick Cookware. And they were under a hundred bucks. 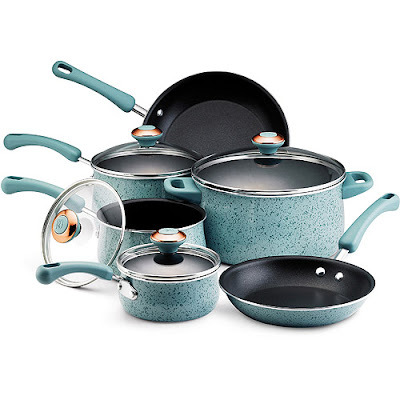 I have this new thing for anything blue, and thinking about all the crappy pots and pans (minus my two lovely Calphalon pans from my parents) I had to unpack made me sad. I figured I'd give them a shot, although I wasn't convinced they would be what I wanted (especially considering the price). Paula Deen has to be bad at something, right? Well, she's not bad at pots and pans; these things are awesome! I haven't been cooking anything "real" yet, just Reubens, macaroni and cheese, and soup. But these pans cook evenly and clean up easily. When I actually get everything unpacked and I'm really cooking again, I think they will be just as wonderful. But don't take my word for it. Read all the other reviews! Glad to see you blogging, Erin! I miss you! I like them. Do they have then in red? Yes, Mom. They have them in red, too! Those are so cute, they remind me of robins eggs or easter.